Malawi has joined the bulk of African countries that support Morocco’s territorial integrity as the two nations see bright future for bilateral cooperation. Morocco’s south-south cooperation approach that has yielded flagship projects in the continent is luring African states to strengthen ties with the North African Kingdom. Malawi’s Foreign Minister Emmanuel Fabiano who met his Moroccan counterpart Nasser Bourita Monday in Rabat expressed his country’s willingness to seal mutually beneficial partnerships in Morocco’s areas of excellence. The Malawi official cited training, foreign direct investments and trade as the North African nation has ushered key investments in finance, agriculture, fertilizers production and tourism in many partner countries in Africa. The country’s phosphates giant OCP has launched flagship projects to build fertilizers plants in Nigeria and Ethiopia. Morocco and Nigeria have also agreed to launch a gas pipeline that will have a beneficial return on West Africa’s energy security. Even African countries that were until recently left out by Morocco’s foreign policy are now back on the radar. The visits by King Mohammed VI to Rwanda, Ghana, Zambia, South Sudan and Tanzania to mention but a few are ushering a new dawn in Morocco’s relations with the continent to which it belongs. 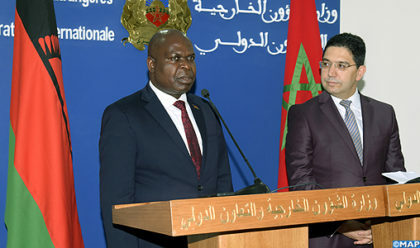 “The more cooperation there is between Morocco and the Southern African Development Community, the smoother the cooperation between Malawi and Morocco within the African Union,” the Malawian foreign minister said. In May 2017, Malawi announced it no longer recognizes the Algeria-backed SADR republic. Through such a decision, Malawi joined its voice to more than two thirds of African countries that support Morocco’s sovereignty over the Sahara.